airberlin flies to Europe from New York JFK, Miami, Los Angeles, Chicago, Fort Myers, and Cancun; however it’s not a well-known name in North America. 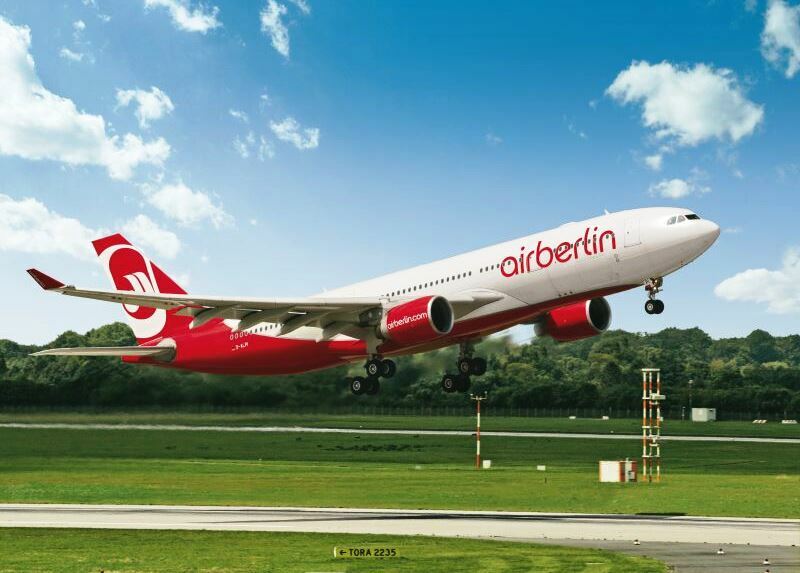 Via airberlin’s convenient hubs in Germany, service is offered to destinations throughout Europe and the Middle East, and the airline is fast becoming a great alternative to established carriers. In the past, airberlin was known mainly as a leisure airline; this is changing, as the introduction of the new business class cabin on the carrier’s A330 aircraft has provided it a world class product on a par with or even above the better known names, meaning the airline can now also be a business traveler’s first choice when traveling between cities it serves. 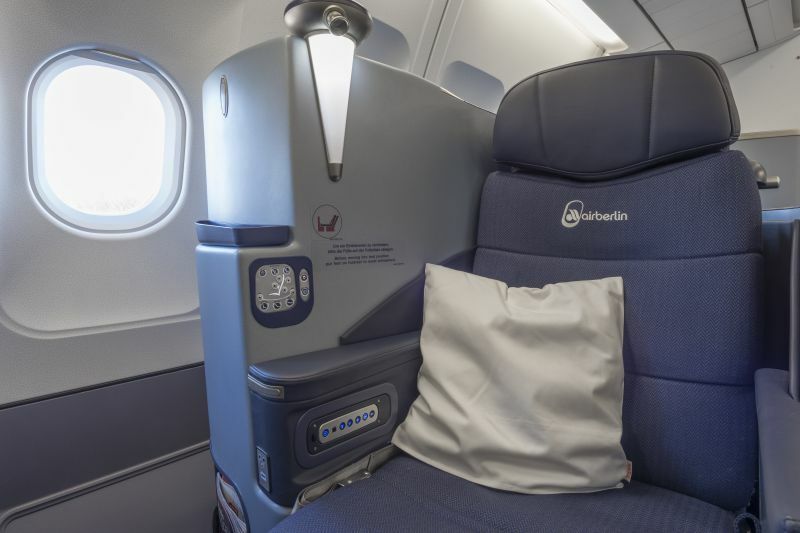 On a recent round trip between Cancun and Düsseldorf, I was able to experience the new airberlin business class product and service for myself. From Düsseldorf, I connected onwards to London (and return); a single class service on a Q400 commuter aircraft; I was offered preferred seating on the connecting flight, with an empty seat next to me, since there was no business class section. 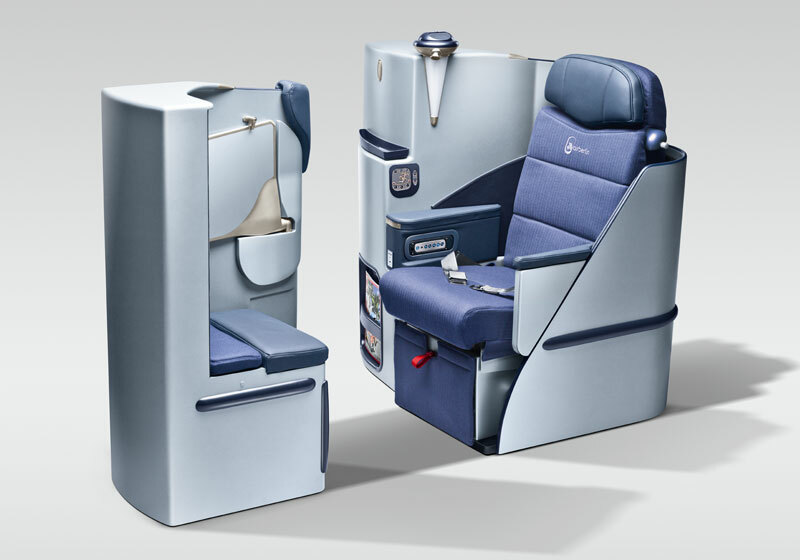 The business class service begins with a separate line for check-in and a baggage allowance of two pieces, each weighing up to 32kg. Priority labels were attached and seemed to work; my luggage appeared speedily at the end of each of my journeys. Even at airports where no business class service is offered (for example London Stansted), there is a priority check-in line, which passengers holding business class connections are invited to use. The business lounges offered in most airports provide a quiet and comfortable place to wait for the flight; Cancun’s Mera Business Lounge is far from spectacular, however is a better option than sitting in the mall-like departure hall. 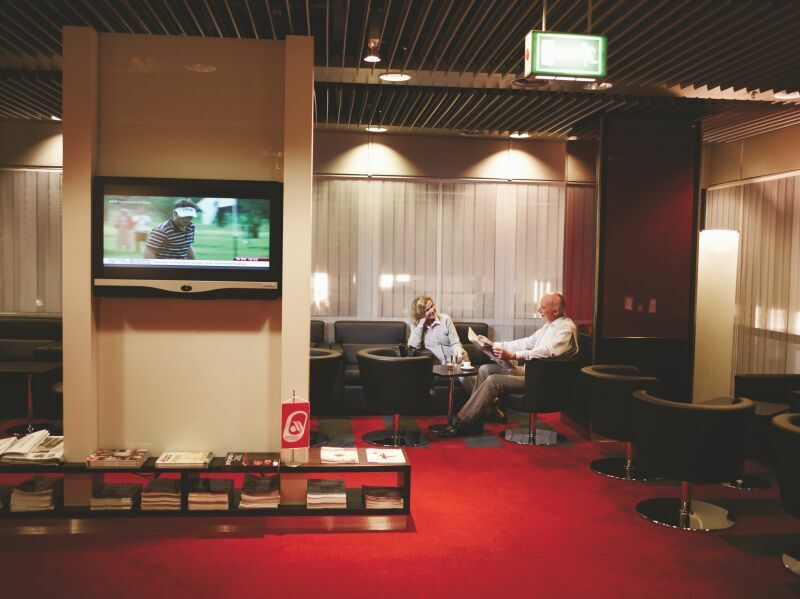 On my return from Düsseldorf, I enjoyed several hours in the airberlin operated business lounge, which served a pleasant breakfast, along with a self-service open bar and excellent coffee, and provided a peaceful place to catch up on emails before the long flight. 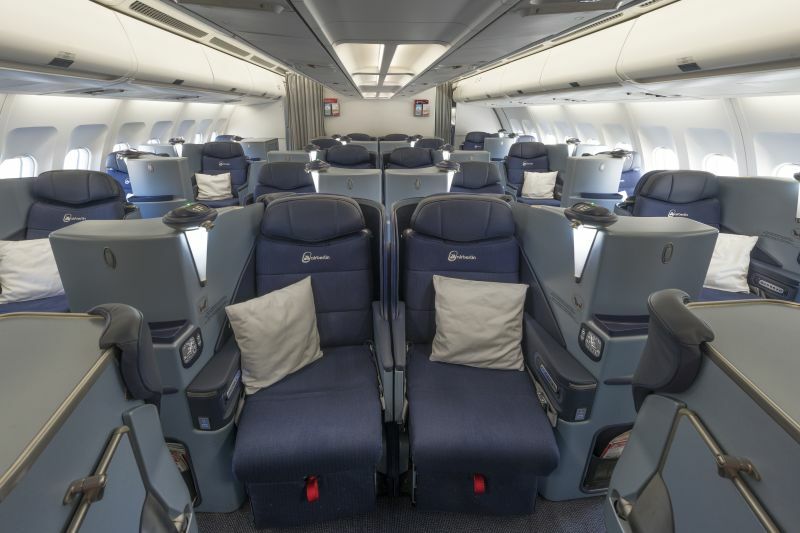 Once onboard, the benefits of the new business class seating plan quickly become obvious; the seats are in a staggered pattern, and of the 19 business class seats, 13 are individual, with the remaining 6 being in 3 pairs. 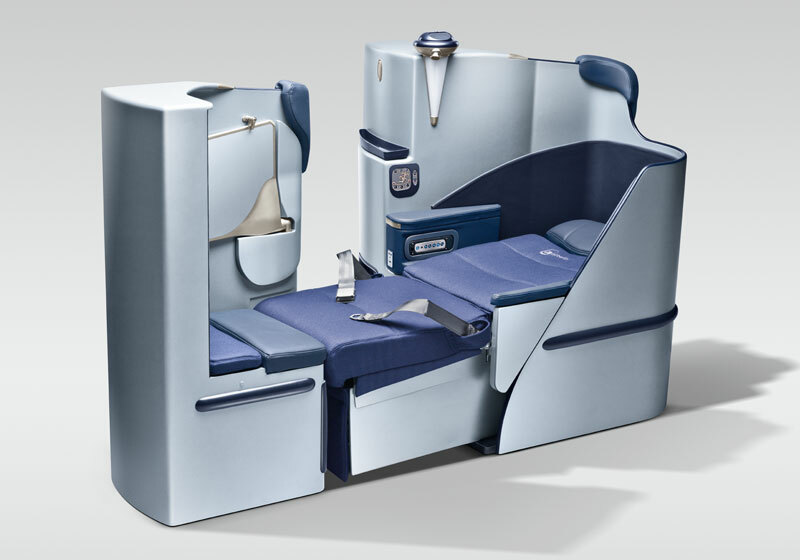 It’s a clever layout, which recognizes the fact that most business class travelers are alone, and prefer privacy to sociability. 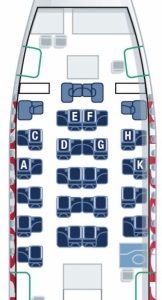 Seats E and F are the pairs; to be found in the center of the cabin in rows 1, 3, and 5. The remainder of the seats are individual; A and K seats offering the most privacy of all, situated as they are against the windows, well protected from the aisle. C, D, G and H seats are individual but closer to the aisle, offering easier access but less privacy. 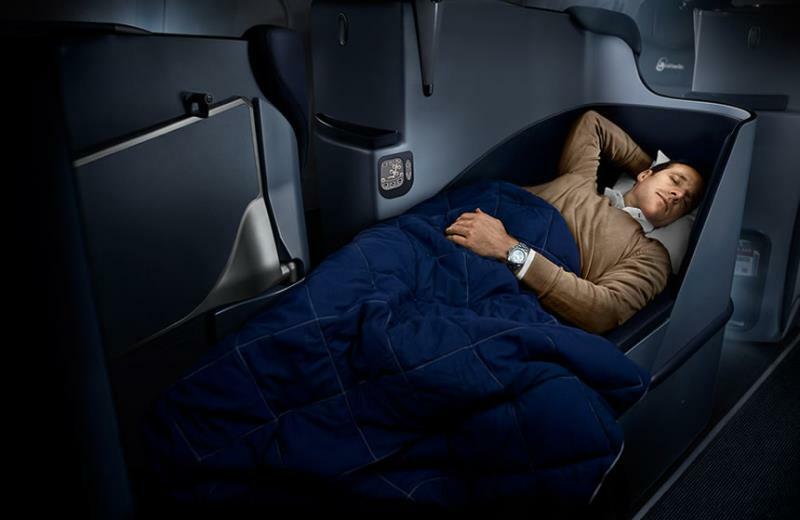 All seats have direct aisle access, and all seats recline to become completely flat beds. The large foldaway table provides plenty of space for dining or working. Ample overhead bins were more than sufficient for all carry-ons on both my recent flights. I found the seat comfortable, and when reclined fully flat, a more than adequate space for someone of my height (5’8”) to stretch out. Large pillows and quilted blankets were provided, adding an extra touch of comfort. The seat was well equipped with power ports; both a USB port and a standard 110v outlet are available. Seats offer an optional massage function, which I found slightly off-putting; if you are used to massage chairs however, it may be an appealing feature. An amenity kit contains L’Occitane products, and a great touch is the offering of a pair of airberlin branded slippers to wear during the flight, and take home for further use. Shortly after sitting down, I was offered a welcome glass of Champagne or orange juice, and the menu. Soon after departure, cocktails were served, with a dish of mixed nuts. 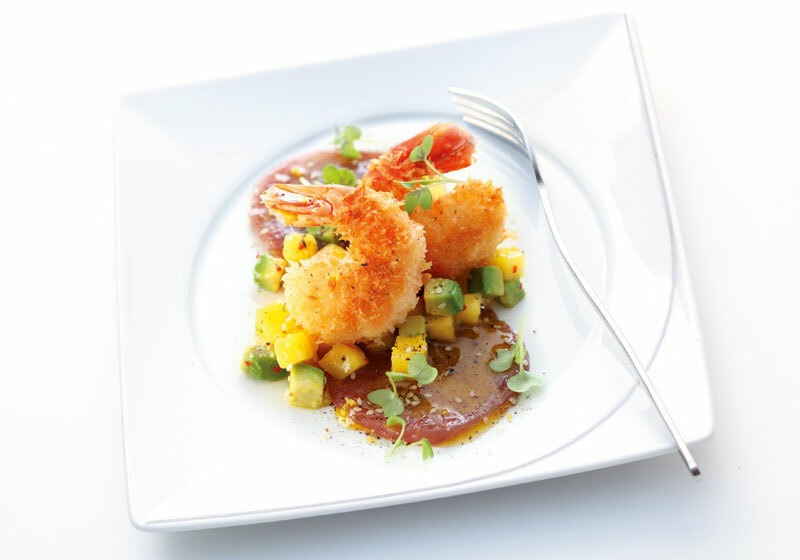 Business class meals on airberlin are created by the well-known restaurant Sansibar, on the North Sea German island of Sylt. 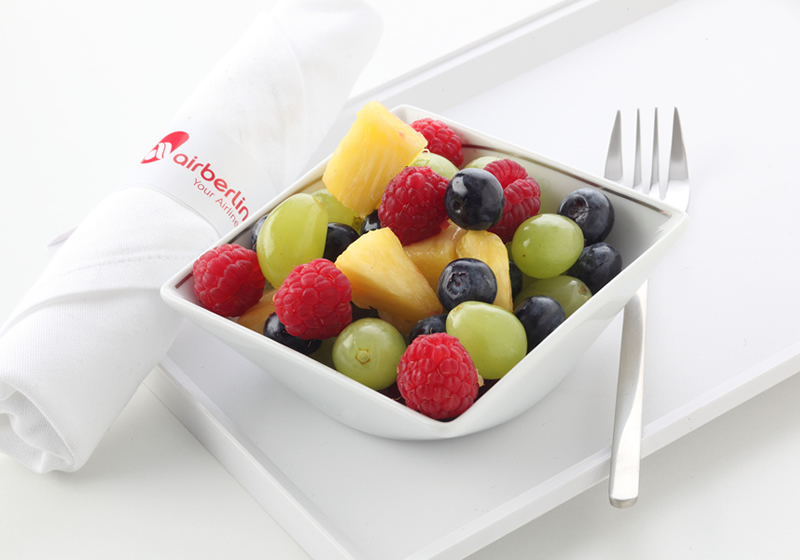 Sansibar has become synonymous with culinary delicacies, renowned well beyond the island, and on airberlin, the meal service is sure to be a highlight of your journey. On both flights, the main meal service was excellent in quality; in particular I found the “Fillet of Cod in a Dill Cream Sauce on Spinach Tagliatelle with Carrot Strips, garnished with Cherry Tomatoes and Mushroom Slices” (which featured for dinner on my outbound flight) to be outstanding; equal in quality to a top class restaurant. On my return, the meal was also delicious; the stand-out dish in this case was the “Thai Beef Salad” served as an appetizer. A selection of hot German bread rolls accompanied the meals. A good choice of red and white wines from the Sansibar cellars were offered, representing vintages from Italy, Germany, South Africa, France and Spain. For Champagne connoisseurs, Louis d’Or Brut, Cuvée Louis le Grand was served. During the night on the outbound flight, a selection of snacks was available in the galley, and prior to arrival in Düsseldorf, a substantial cold breakfast was served. On the return long daytime flight, a mid-flight snack consisting of a sandwich and fruit salad was offered, followed by a cold meal before landing back in Cancun. Throughout the daytime flight, the cabin crew was constantly on hand to refill drinks, and provide light snacks to anyone who was hungry between meals. Hot beverage choices included espresso and cappuccino from Nespresso, as well as an impressive selection of teas. I found the service provided by the cabin crew to be excellent yet unobtrusive; they struck the perfect balance between being available, but not annoying. In each case, I was initially addressed in German by the cabin crew; having realized that I could not speak the language, they immediately switched to English, and remembered my language preference throughout the flight. Onboard entertainment is provided by a 15” LED monitor, with excellent noise cancelling headsets for the audio. A diverse program of recent and classic movies, TV shows, music, audio books and video games is offered, or you can connect your own device. The ‘moving map’ provides a fascinating background option if you prefer not to watch anything else. My flights between Düsseldorf and London Stansted and return were operated by a single class Q400 aircraft; the short flights featured a quick beverage and snack service. All four of my airberlin flights in my recent itinerary departed on time and arrived either on time or early. Onboard service was excellent, and my luggage was speedily delivered. This was my first experience with airberlin; I’m looking forward to flying with the airline again. 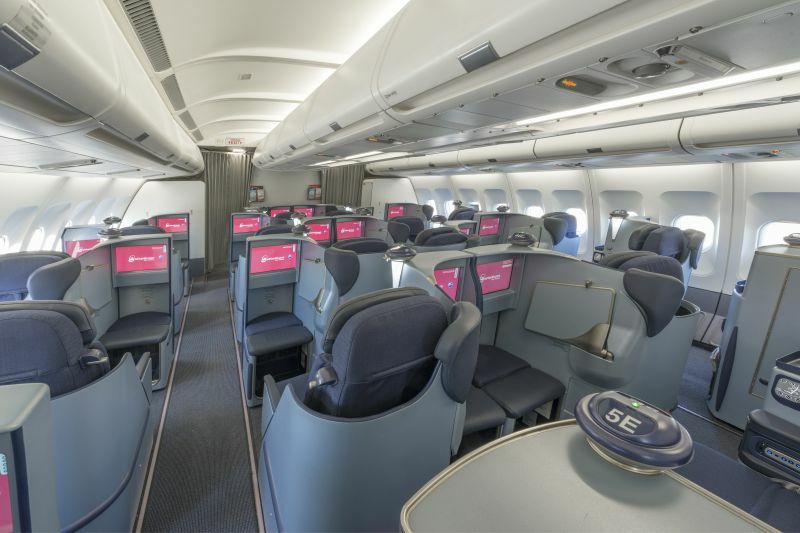 On June 5, 2014, airberlin announced that it had received the “Best Business Class Airline Europe” award from British trade journal ‘Business Destinations’. airberlin is a strategic partner of Etihad Airways, and a member of the oneworld alliance. 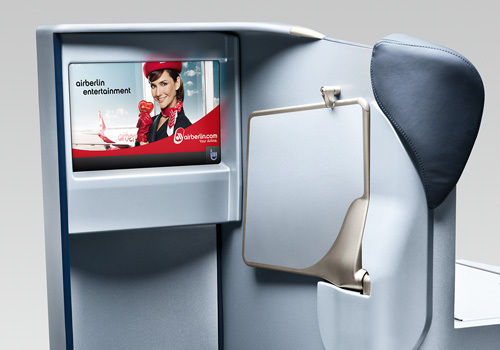 For more information, flight bookings, etc., visit www.airberlin.com. Stewart Mandy paid for travel on airberlin in economy class at his own expense and was upgraded to business class as a guest of airberlin.